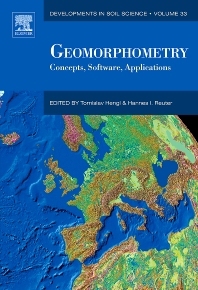 Geomorphometry is the science of quantitative land-surface analysis. It draws upon mathematical, statistical, and image-processing techniques to quantify the shape of earth's topography at various spatial scales. The focus of geomorphometry is the calculation of surface-form measures (land-surface parameters) and features (objects), which may be used to improve the mapping and modelling of landforms to assist in the evaluation of soils, vegetation, land use, natural hazards, and other information. This book provides a practical guide to preparing Digital Elevation Models (DEM) for analysis and extracting land-surface parameters and objects from DEMs through a variety of software. It further offers detailed instructions on applying parameters and objects in soil, agricultural, environmental and earth sciences. This is a manual of state-of-the-art methods to serve the various researchers who use geomorphometry. Soil scientists will use this book to further learn the methods for classifying and measuring the chemical, biological, and fertility properties of soils and gain a further understaing of the role of soil as a natural resource. Geologists will find value in the instruction this book provides for measuring the physical features of the soil such as elevation, porosity, and structure which geologists use to predict natural disasters such as earthquakes, volcanoes, and flooding. Secondary: students in upper level GIS/geomorphology classes; Graduate students in soil science, quantitative ecology, earth sciences, GIS, geography, and geodetic sciences.